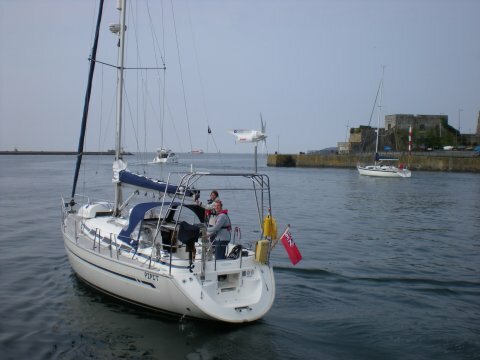 Well we have at last sailed from Plymouth, Tuesday 18th May 2010 - all the way to Fowey! Ok, so it was no epic first passage, but that is what we had intended to allow us to be sure that all we had loaded aboard was stowed securely, both below (more than just a couple of Ann's Tupperware containers!) and above decks (the Nestaway dinghy and new liferaft). It was quite an emotional moment for both of us, but we had a nice final send off from Kim, Trudie and Simon from Liberty, including a bottle of bubbly the night before and a wave off from the QAB Breakwater on Tuesday morning. 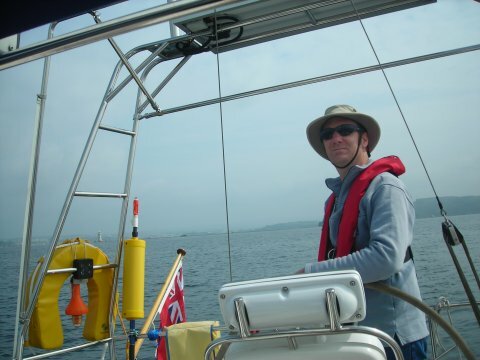 Incidentally, good luck to Kim for his upcoming Two-Handed Round Britain & Ireland Race starting on 5th June - see his blog here. Despite not having sailed for nearly 8 months since starting the upgrades in October last year, we seemed to slip straight into the groove again and remembered what all the bits of string and flappy things were supposed to do. Other than have run one of the reefing lines (though not needed in the conditions) through the wrong way when we bent the sails back on in early April, all went perfectly for the passage in F3-4 S-SW winds. The seas were slight although visibility was disappointingly hazy and beating meant we felt the chill still in the air, unusually still quite cold for mid May. 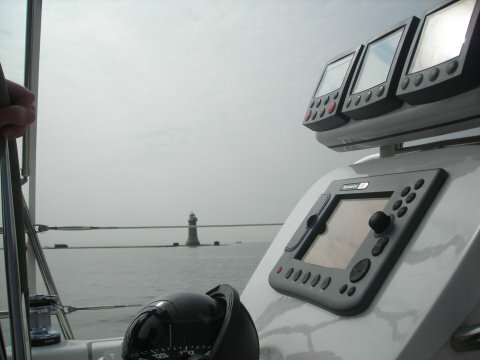 The winds dropped away to about 5 knots and headed us to the point that off Udder Rock buoy, we had to motor the remaining few miles into Fowey. As forecast, today (Wednesday) is grey and drizzling, so Andy has buckled down and is doing a day's work. If the forecast continues to be correct, the weather is improving over the next few days, including the slightly higher temperatures we should be getting now. We'll probably stay here in Fowey for another night or two before sailing down to Falmouth so spend a week or so, as always, weather and interesting diversions notwithstanding! To backtrack slightly, following the problems we had when we first moved aboard, in hindsight, having spent nearly a month moving out of two houses, it was unrealistic to have expected to do the last few jobs (mounting the liferaft, securing the dinghy) and stowing everything below in just a few days before setting off. In the end, including the delays waiting for the new mainsheet traveller end stops to arrive from Sweden, from moving aboard, we set sail just 3 weeks later to the day.